This article is about Rhododendron ponticum. For Azalea pontica, see Rhododendron luteum. In Asia it occurs in Turkey, Lebanon, Georgia, the Krasnodar area of southern Russia, the Himalayas, Afghanistan, Tajikistan, Northern Pakistan, and parts of Kashmir into the northern Republic of India (Himachal Pradesh, Uttarakhand). It is the state flower of Jammu and Kashmir. In some parts of the world, a controlled dosage of the honey can be taken to induce hallucinations for spiritual or psychological purposes. Such areas include Nepal. Suckering of the root, together with its abundant seed production, has led to it becoming an invasive species over much of western Europe and in parts of New Zealand. Rhododendron control is a key element in nature conservation in those areas. Conservation organisations in Britain now believe R. ponticum has become "a severe problem" in the native Atlantic oakwoods of the west highlands of Scotland and in Wales, and on heathlands in southern England, crowding out the native flora. Clearance strategies have been developed, including the flailing and cutting down of plants with follow-up herbicide spraying. Injection of herbicide into individual plants has been found to be more precise and effective. ^ Alice M. Coats, Garden Shrubs and Their Histories (1964) 1992, s.v. 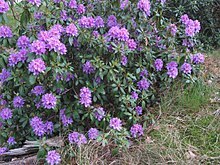 "Rhododendron"; http://www.countrysideinfo.co.uk/rhododen.htm#Introduction%20to%20Britain . ^ Hayes, Andrew Wallace (2007). Principles and methods of toxicology. CRC Press. p. 998. ISBN 978-0-8493-3778-9. ^ "New flora and fauna for old". The Economist. 2000-12-21. Archived from the original on 2001-07-28. Retrieved 2008-12-14. ^ "Rhododendron: A killer of the Countryside". Offwell Woodland & Wildlife Trust. 2004. Retrieved 30 May 2010. ^ "BREAKTHROUGH IN BATTLE AGAINST PROBLEM PONTICUM". Forestry Commission. 30 July 2004. Archived from the original on 5 March 2011. Retrieved 30 May 2010. ^ Tiedeken, Erin Jo; Egan, Paul A.; Stevenson, Philip C.; Wright, Geraldine A.; Brown, Mark J. F.; Power, Eileen F.; Farrell, Iain; Matthews, Sharon M.; Stout, Jane C.; Manson, Jessamyn (November 2015). "Nectar chemistry modulates the impact of an invasive plant on native pollinators". Functional Ecology. 30 (6): 885–893. doi:10.1111/1365-2435.12588. "Rhododendron ponticum". Germplasm Resources Information Network (GRIN). Agricultural Research Service (ARS), United States Department of Agriculture (USDA). Milne, R. I., & Abbott, R. J. (2000). Origin and evolution of invasive naturalized material of Rhododendron ponticum L. in the British Isles. Molecular Ecology 9: 541–556 Abstract. Wikimedia Commons has media related to Rhododendron ponticum.